I submitted a paper to a Taylor and Francis journal that uses the ScholarOne submission system. The manuscript status has changed from "Under Review" to "Awaiting Reviewer Scores". What does this change mean? What is the flow chart of the different statuses for a manuscript? 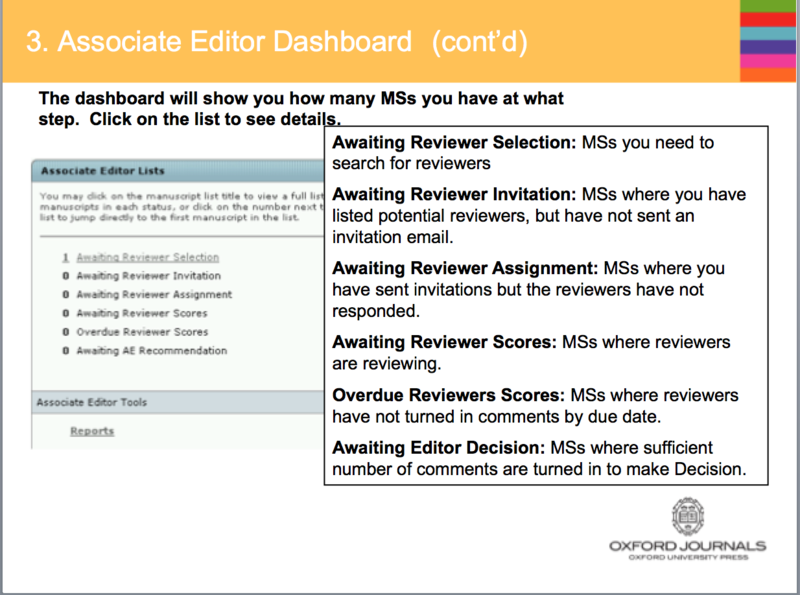 With a typical ScholarOne configuration, "Awaiting Reviewer Scores" means that it is actually out with (at least some) reviewers, while "Under Review" would instead mean the previous stage, where it is being considered by the handling editor(s) and might still be rejected without review. After the review scores come back, a manuscript then returns to the handling editor for a recommendation, and thence up to the chief editor(s) for a decision. I have found a tutorial for Editors for Oxford journals. I think, this slide explains it all. "Awaiting Reviewer Scores" means that the paper has been assigned the minimum amount of reviewers that the Associate Editor has set for the manuscript. The minimum would be either two or three depending on the publication but the associate editor might have sent a few more invitations around. "Under Review" means that reviewers have been selected and invitations have been sent out but some of them have not responded yet or some of them have rejected the invitation and the editorial board is still looking for reviewers. I also think that it is up to the specific settings of each journal to show the different status of the review process. In some you can see "Under Review", "Awaiting Associate Editor Recommendation", "Awaiting EIC decision" etc but in others you just see "Under review" for the whole process. None of the answers above are accurate at least in my scenario. I had a revision decision, and after I submitted the revision, the status went to "Under review", and after about 4 weeks, it has now changed to "Awaiting reviewer scores". In this case, the reviewers were already lined up to get the revision, and so it doesn't make sense for "awaiting reviewer scores" to just mean that the reviewing is in progress -- in fact, it's "under review" that means that, and it doesn't make sense for "under review" to mean pre-screening. What the "awaiting reviewer scores" most plausibly means here is that the reviews are now due! 4 weeks is also the time I'd expect the AE to allot for the reviewers (from past experience), and so the timing is right for the status to change from "Under review" to "Awaiting reviewer scores" - so it just means some reviewers haven't yet submitted it and the reviews are either due or overdue. This explanation also makes sense if you just look at the English of the status "Under review" and "Awaiting reviewer scores" -- the scores aren't awaited unless it's due! It's probably why they chose this language for the status message. In addition, for all my submissions in the past, the "Under review" status has always meant that the paper was actually with the reviewers as opposed to with the AE waiting for the assignment; papers have been in the "Under review" status for me for several months after which they change to "Awaiting AE recommendation". So it makes no sense that "Under review" means pre-screening (as suggested by one of the comments) - it may be different for different journals but I doubt that is the case for any journal. Yes, Indeed mine is undergoing the same process as we speak. under review basically means that your manuscript is still with the handling editor and is being reviewed if instructions were followed, thus fit enough to be sent to blind reviewers. Awaiting reviewer score, it has been sent out to selected reviewers and is still awaiting for their scores (comments). Awaiting reviewers scores simply mean the article is with the reviewers and the journal office is waiting for the comments. Under review also can mean that the article is being considered by the science editor for technical and English language check or it is with the subject editor and he is evaluating it for external review, or the article is with the reviewer for evaluation. So, the former (Awaiting reviewers scores) is a direct statement that the article is with the reviewers. Not the answer you're looking for? Browse other questions tagged journals paper-submission journal-workflow or ask your own question. “Awaiting EE Decision” in Manuscript Central – what does it mean? “Awaiting EO Processing” for 2 weeks after submission. Should I contact? My paper was under awaiting reviewer assignment then awaiting ed final processing. What does this indicate? What does “Peer review in process” mean in ScholarOne submission?